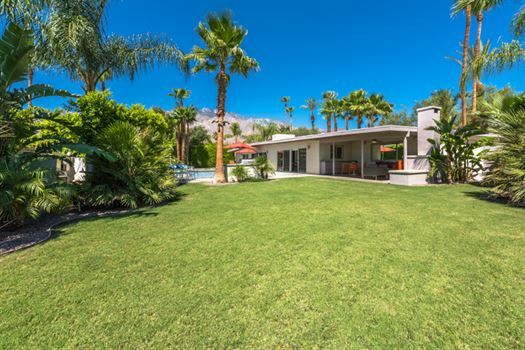 This sparkling new mid century remodel is the epitome of indoor/outdoor Palm Springs living. 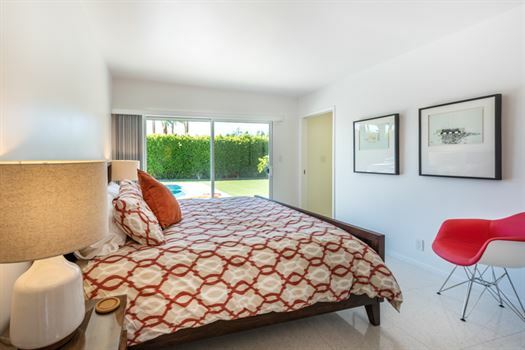 Beautifully furnished and appointed with luxury to enjoy your desert getaway. 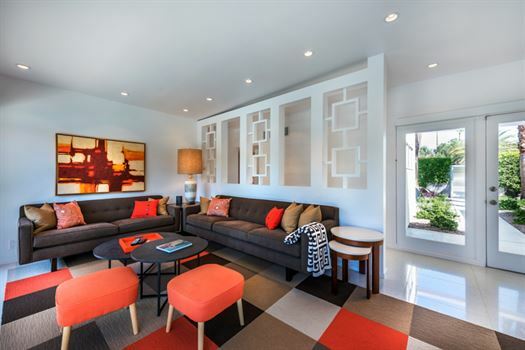 Walls of sliding glass doors in the open plan kitchen, dining room, living room and master bedroom invite you to step out into your own private retreat with an expansive backyard with green lawn, south facing pool, spa and quiet outdoor sitting space. Located in Movie Colony East this fully hedged property wrapped in lush landscaping, is on a very quiet street allowing complete privacy in a serene oasis, yet it's just minutes from downtown Palm Springs, the trendy Uptown Design District and numerous restaurants and boutiques to enhance your enjoyment of the desert lifestyle. 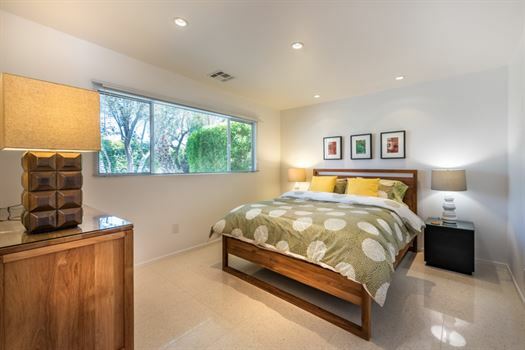 This pristine home features an open floorplan with terrazzo floors throughout and a gorgeous bright open kitchen and dining room. 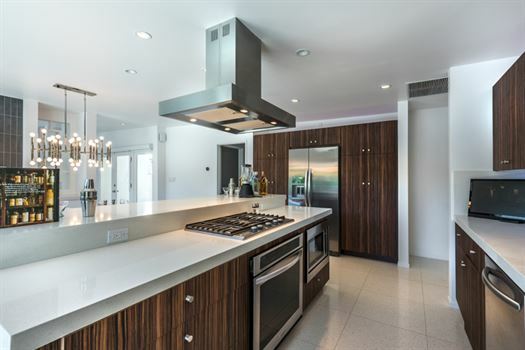 With expansive Corian counters, KitchenAid appliances, and fully stocked cookware, this is the perfect kitchen for preparing gourmet dinners or a casual Sunday brunch. 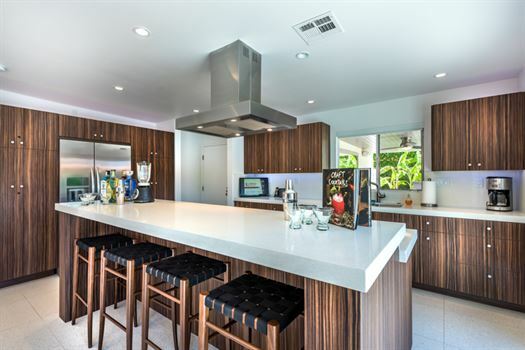 The kitchen island and breakfast bar is superb for serving family-style meals or evening cocktails. 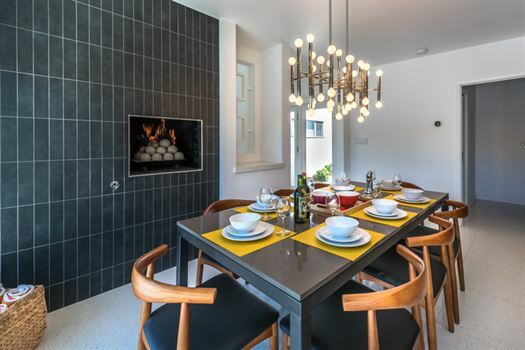 The dining table comfortably seats 8 and has its own gas fireplace setting the ambiance for family, friends or romance. 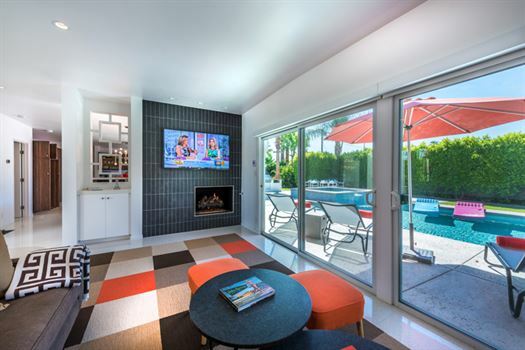 The open living room with a wall of glass facing the pool features ample seating on two sofas, a gas fireplace, and a 60 inch TV with access to all of your on demand services (Apple TV, Netflix, Amazon, Hulu, etc. ), perfect for enjoying your favorite shows or a movie. 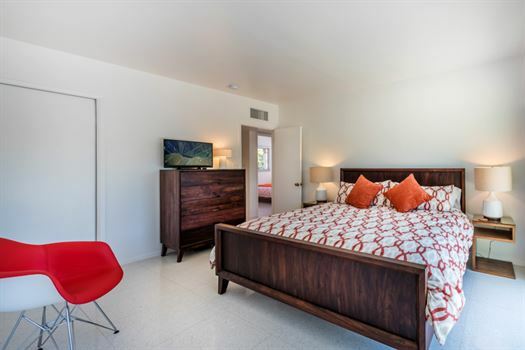 With four bedrooms and three full baths, the master bedroom has a king size bed, walk-in closet and beautiful ensuite master bath with a sliding glass door in the walk-in shower providing outdoor access. 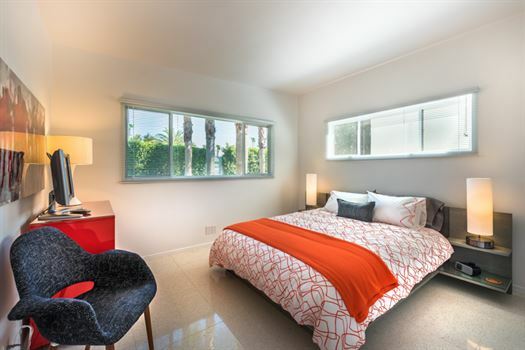 The second ensuite bedroom features a queen bed and private bath with a shower tub combo. 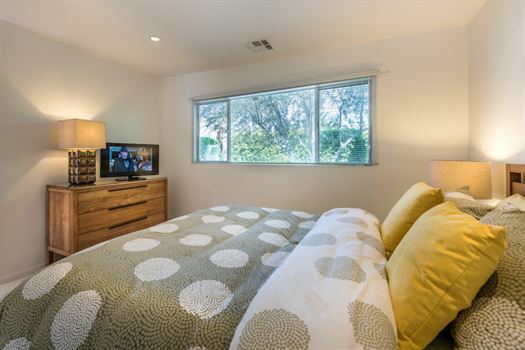 Two additional bedrooms both have queen beds and ample closet space and share a large full bath. 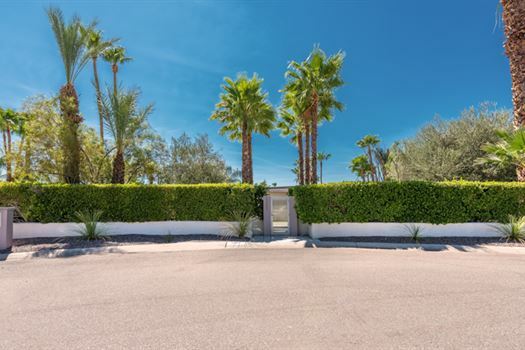 This home features an extra-large south facing retreat-feel backyard with an expansive lawn area, sparkling saline pool and large spa with spillway into the pool, all surrounded by palms and lush greenery. 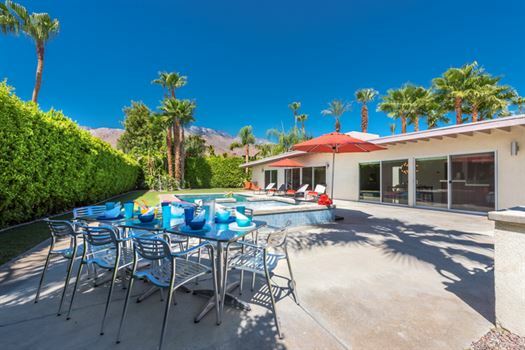 Take in views of the San Jacinto mountains while relaxing in chaise lounges under large umbrellas, or from the gorgeous outdoor covered space with plenty of seating that offers shade on a bright afternoon, relaxation with a cocktail or a place for family games. 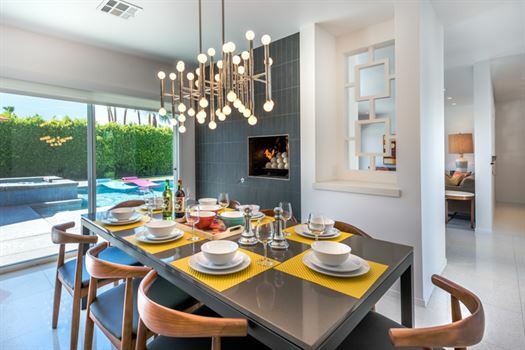 Finally, enjoy an evening of grilling on the built in gas BBQ and dining at the table of 8 while the outdoor gas fire pit and landscape lighting complete the perfect desert vacation. Beds - King, Queen, Queen, Queen. 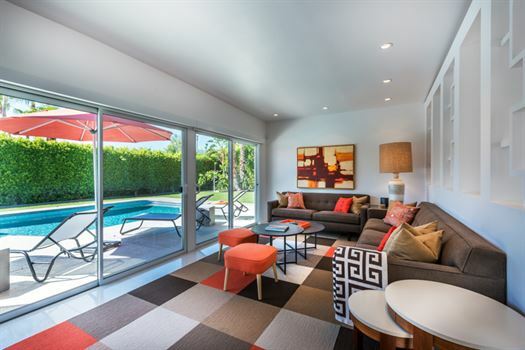 Downtown Palm Springs about 1 mile, short drive to restaurants, grocery shopping, parks, 10 minutes to Palm Springs airport, 5 minutes to Palm Springs Aerial Tram. Michael, Chris, Eric and team are top notch and Casa Tiempo is stunning inside and out! This house met our needs on every level. 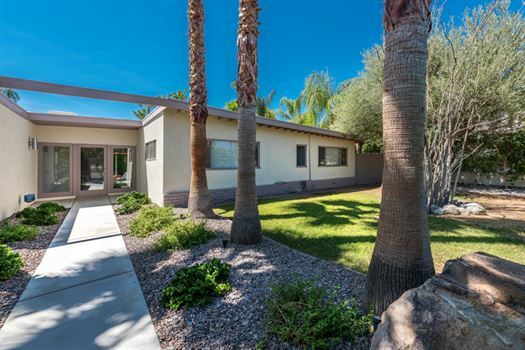 From the huge backyard filled with lush green grass, for our dogs to run and play on to the giant pool and jacuzzi which you can access from almost every room in the house... so if you need to watch your kids play, this is the house for you. 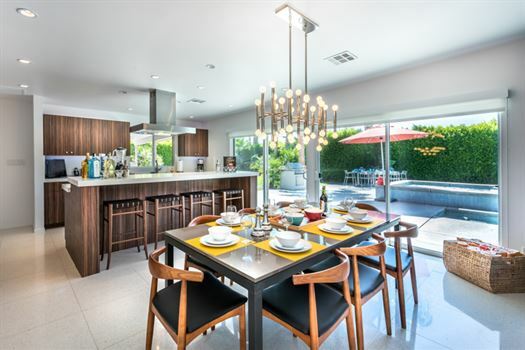 The decor is stunning and the kitchen has everything you could possibly need. 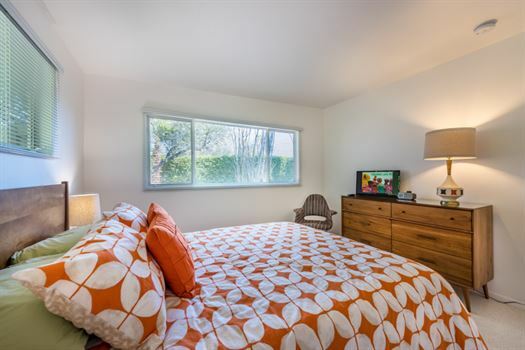 Each room has a TV too, so you never have to miss your favorite show as you switch from room to room. 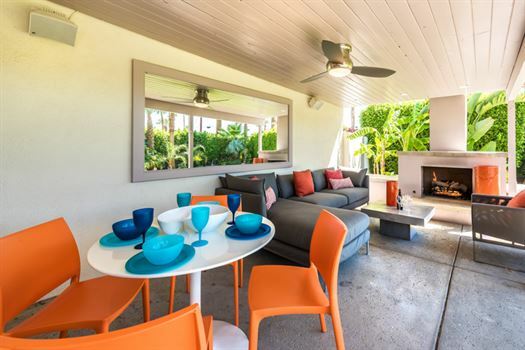 There is a gorgeous fireplace outside which is in a covered patio lined with plush couches, so it makes for the perfect evening of just relaxing and entertaining. 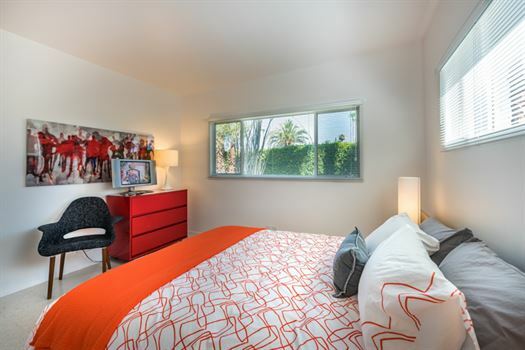 The beds are comfortable and there is plenty of storage to store your belongings. 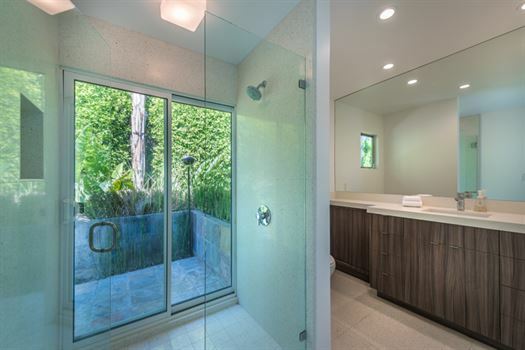 You also get major privacy here, with a Beverly Hills-like giant hedge, so that is a huge plus. Not to mention the views of the mountains and palm trees. This place is paradise and we can't wait to come back! 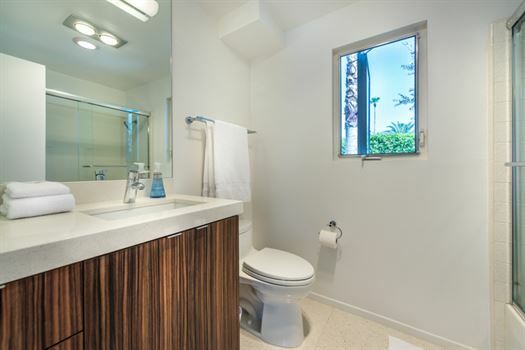 I'm reviewing Oasis Rentals for the two times that I have used their rental services. Once in June 2016, and again in Sept 2016. I rented the same home both times. I have been consistently impressed with Oasis Rentals' professionalism, accommodation, and quality. My first time renting from Oasis Rentals back in June 2016 was my first time renting a vacation home in general. I had my concerns and hesitation that the home would not live up to the pictures and descriptions. The moment I walked through the home with Eva, I was blown away! The rental home was clean, well stocked, well designed/decorated, and welcoming! There is an instruction binder to refer to in case you do not know how to operate the electronics in the home. 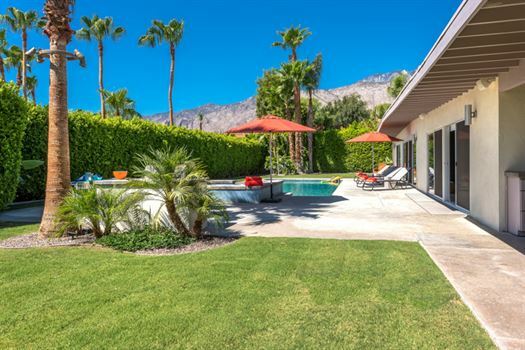 Oasis Rentals is clear and up front about the city's ordinances and their expectations for their guests to enjoy themselves, but at the same time, be courteous to the Palm Springs residents who live there year round. 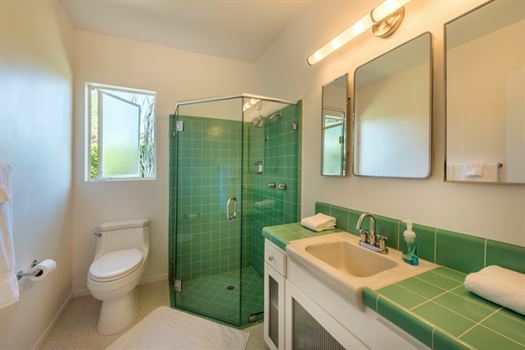 My guests can't stop raving about the quality of the rental property. I already have plans to use Oasis Rentals again for the upcoming holidays! I feel that they really try to listen to your needs and deliver their best each time! They are quick with responding to questions and they are fair/realistic with policies and formalities. I have and will continue to recommend Oasis Rentals to my friends and family! Spent a long weekend here to celebrate a birthday, and it was simply perfect. 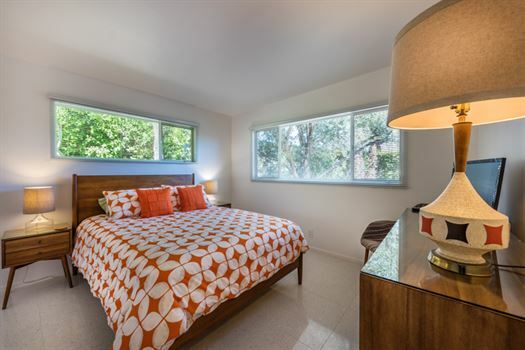 The house is gorgeous and an excellent mid-century modern dream home. Every detail has been thought through, and it was beautiful. The team at Oasis was great to work with, and we'll definitely plan to rent with them again. Eva was lovely, and Christopher was very helpful with general logistics! Thanks, Oasis! Perfect weekend achieved!